Rotterdam is a city located on the Maas river in central Holland. It’s home to the largest harbour in the world, and is one of Europe’s busiest ports. Cruise ships are anchored at the Holland America Line headquarters on Wilhelmina Pier at the south end of Erasmus Bridge. Smaller vessels can dock closer to downtown Rotterdam along Boompjes, between the Erasmus and Willems bridges. The cruise ship passenger terminal is only a short distance away from most city centre hotels. Cruise vessels tie up right in the heart of the city on Wilhelmina Pier, which is across the Erasmus Bridge from the city centre (by the old Holland America Line headquarters). Smaller ships are able to dock along Boompjes, between the Erasmus and Willems bridges closer to downtown. Rotterdam is a rather compact city, very walkable and easy to explore. You can choose to stay right next of the cruise terminal, which is a little outside the city centre, or obtain for an accommodation right in the heart of the city near the central train station. Nearest place to stay is Hotel New York (used to be HAL’s headquarters.). Another property nearby is 4 star nhow Rotterdam. When flying in or out of Amsterdam Schiphol Airport staying near the airport can be very convenient. Several hotels near the airport offer free airport shuttle service. Rotterdam can easily be reached by train. Popular is a trip to the historic city of Delft, which is home to the popular blue and white pottery and fine porcelain. Amsterdam hotels are just an hour away. 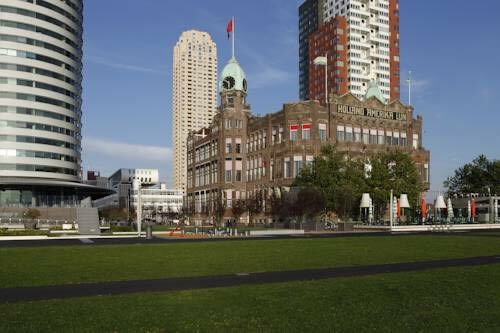 Excellent hotel situated on Wilhelmina Pier, location of Rotterdam Cruise Terminal in The Netherlands. Charming hotel set in the former head office of the Holland America cruise line. Right next to passenger terminal. Highly recommended hotel located in the Oude Haven (Old Port) Rotterdam, not far from the quay and city centre. 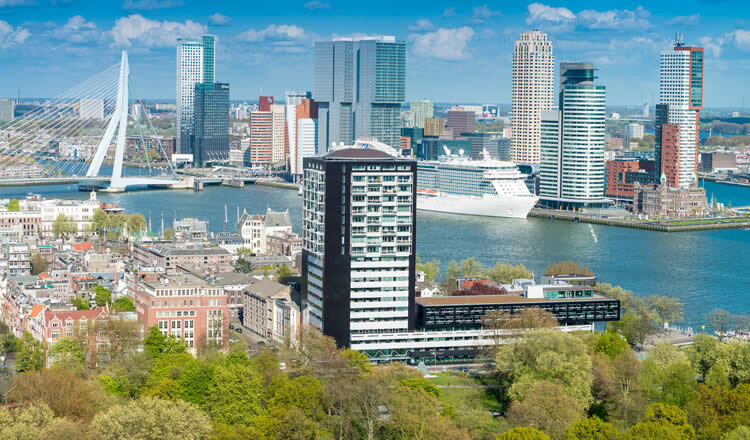 For cruise ships arriving in Rotterdam as a port of call a complimentary shuttle service is provided from the front of the terminal to take passengers to the centre of Rotterdam and the Central station. Hotels and b&b’s are an inexpensive taxi ride away from the embarkation or disembarkation terminal. In the Port of Rotterdam, Keppel Verolme operates one of Europe’s largest dry docks which is able to undertake repair, maintenance and construction of various vessel types. Large cruise ships from Royal Caribbean International (RCL) such as the Enchantment of the Seas or Oasis of the Seas have visited the shipyard in Rotterdam for a refurbishment. Popular ports of call on Rotterdam cruises are the port of Hamburg, Southampton in England UK, the Norwegian Fjords (Oslo Norway) and the Baltic. The main cruise company operating from the Port of Rotterdam is the Holland America Line. HAL is a company with a long history. From 1873 untill 1973 the company, first named as “Netherlands-America Steamship Company”, carried hundreds of thousands of passengers from Rotterdam to New York in steamships with familiar names such as the “SS Rotterdam”, the “SS Nieuw Amsterdam” and the “SS Statendam”. Rotterdam is a fascinating place to visit and experience. It boasts modern architecture, high rise buildings, many interesting museums, an abbundance of attractions, excellent shopping opportunities, great restaurants and cafes. It’s a modern city with skyscrapers but also with traces of ancient history. This can be found in the Old Harbor and Delft Harbor area with its traditional wooden windmill and antique shops and cafes that have been reconstructed to look like the historic buildings from many years ago. Shop till you drop around the Beurstraverse or admire old Dutch masters in one of Rotterdam’s fabulous art museums such as the Museum Boijmans Van Beuningen. Interesting is the Maritime Museum which houses a variety of expositions about the harbour of Rotterdam and maritime history. The nearby Harbour Museum gives you a good view of the history of the Port of Rotterdam. Watch cranes hoist cargo and learn what it’s like to work along the docks. For the best view of the city head to Rotterdam’s tallest building, the Euromast. It’s an observation tower with a platform at 96 m or 315 ft above-ground and a restaurant. A major attraction for families with children is the Rotterdam Zoo or Diergaarde Blijdorp and Oceanarium aquarium. Rotterdam Central Train Station — the cruise terminal can easily be reached from the central (centraal) railway station of Rotterdam. You can travel either by tram or metro. At Rotterdam Central Station take tram 20, 23 or 25. By underground take Erasmus line, stop at Wilhelminaplein. Rotterdam Central Station offers direct links to The Hague in 20 minutes and Schiphol Airport in 50 minutes. Rotterdam The Hague Airport — the passenger terminal is located within close distance from Rotterdam The Hague Airport. From the airport you to take the RTC Taxi to the Cruise Terminal, this will take about 20 minutes. Amsterdam Schiphol Airport — The main international airport of the Netherlands, Schiphol in Amsterdam, can be reached within the hour by train or taxi. Parking — long stay car parking at the Port of Rotterdam is located close to the cruise terminal, next to the famous S.S. Rotterdam, a former Holland America Line cruiseship which is now a hotel and convention center. A free shuttle service is available from the car parking to the Rotterdam Cruise Terminal. Dutch is the language in Rotterdam. English is widely spoken. The currency of The Netherlands is the Euro (€). Whether you are looking for a cheap hotel, alternative apartment or a more luxurious place to stay, we can offer you the best deals and great availability for lodging near the Port of Rotterdam, Holland America HAL cruise passenger terminal building. Extend your cruise vacation with a trip to the historic city of Delft, home to the popular blue and white pottery and fine porcelain. Delft is less than 1/2 hour by train from Rotterdam. Keukenhof Gardens to see the blooming tulips is located between Rotterdam and Amsterdam. Just an hour away is the capital of The Netherlands, Amsterdam. 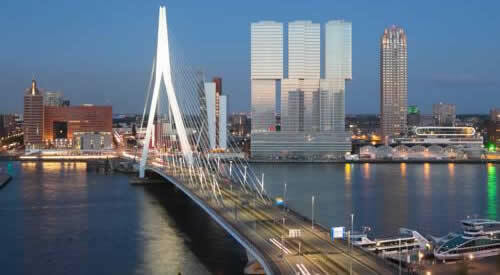 The Belgian cities of Antwerp, Bruges and Brussels are also within easy reach of Rotterdam.